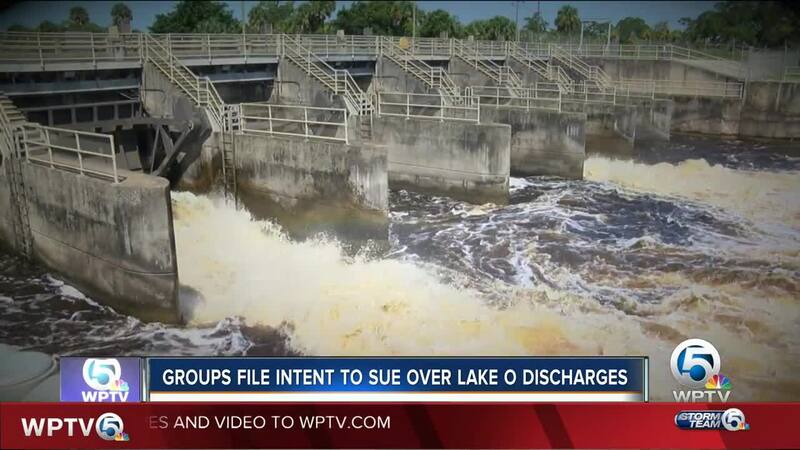 Some groups have filed their intent to sue over Lake Okeechobee discharges. OKEECHOBEE COUNTY, Fla. — Thursday’s severe weather is a reminder of what can cause Lake Okeechobee discharges. The U.S. Army Corps of Engineers are the decision makers behind those releases when lake levels get too high. Now three environmental groups that include The Center for Biological Diversity, Calusa Waterkeeper and Waterkeeper Alliance filed a notice of intent to sue the Army Corps, U.S. Fish and Wildlife, and National Marine Fisheries Service. The notice gives all three agencies 60 days to respond to the claims submitted. A U.S. Army Corps spokesperson declined to comment on the pending lawsuit. However, spokesperson John Campbell said the Corps will begin a study next year that could potentially bring changes to the Lake Okeechobee Regulation Schedule once repairs to the Herbert Hoover Dike are finished. Mike Conner in Martin County called the lawsuit a great argument. “Pummeled by Lake O discharges,” said Conner. He believes there are a number of species threatened by the releases every summer. “Bad water from Lake Okeechobee that possibly fuels red tide are bad for the life of endangered species,” said Conner. Both U.S. Fish and Wildlife and the National Marine Fisheries Service also declined to comment on the pending lawsuit.